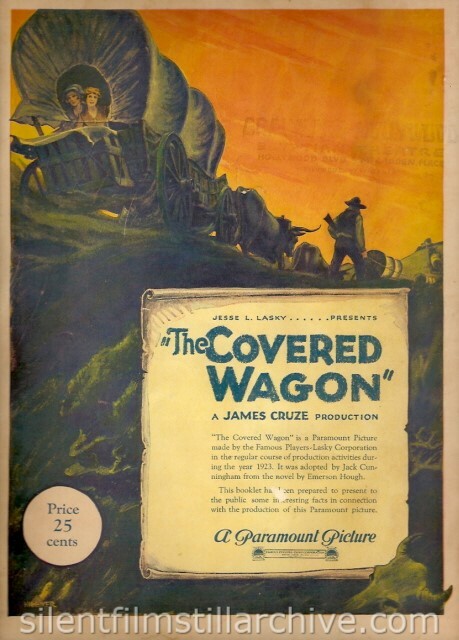 "The Covered Wagon" is a Paramount Picture made by the Famous Players - Lasky Corporation in the regular course of production activities during the year 1923. It was adopted by Jack Cunningham from the novel by Emerson Hough. They were dreamers, these pioneers; they saw visions and they had dreams. The dreamers are the architects of greatness. Their vision lies within their sould. They never see the mirage of fact but peer beyond the veils of mist and doubt and ierce the wals of unborn time. Grief only streaks their hair with silver; it never grays their hopes. in place of stone their spires stab the world's skies. Your homes are built upon a land a dreamer found. The pictures on its walls are visions from a dreamer's soul. A dreamer's pain wails from your violin. They are the eternal conquerors; their vassals are the years. Whatever the future holds in store for us, that story of toil and suffering and final triumph should be held as sacred history by every one who honors devotion to duty in men and self-sacrifice in women. It should be taught to the children in the schools, and the one lesson that should be impressed upon the mind of every child is, that a wrong act on his or her part would be a reproach to the brave men and women who came with plows and covered wagons in the shadow of despair and by incessant toil laid solidly the foundationof our states. "They laid down their lives in toil; they suffered without complaint; from nothing they creatd our glorified states; honor, reverence and glory be everlastingly theirs." A great caraven of covered wagons, filled with hearty pioneers and their families and possessions, under the leadership of Jesse Wingate, are waiting for the Spring "jump off" at Westport Landing, now Kansas City. The time is 1848, and their destination is far-off Oregon. Just before the start, another wagon train from Liberty, Mo., led by a stalwart young man named Will Banion, joins the Wingate caravan. Banion and Wingate's pretty daughter Molly immediately show an interest in each other, to the jealous sidcomfiture of Sam Woodhull, Wingate's right-hand man and Molly's fiance. Banion's pal and bodyguard is Jackson, a grizzled scout of the rough-and-ready school. Jackson makes no bones about the fact that he considers Jesse Wingate a weak and incompetent leader and that Will Banion should supplant him. The bugles blow. The oxen strain at the leathers. The great train of five hundred wagons starts for the Golden West. Two weeks out, during a temporary halt, Banion saves Molly Wingate's life when she attempts to ride his horse and the animal bolts with her. The bad blood between Woodhull and Banion increases. Woodhull tells Wingate that Banion was driven out of the army for cattle-rustling during Doniphan's Mexican expedition. Whereupon Wingate orders Banion to keep away from Molly. After incredible hardships, the expedition reaches the Kaw River. The river is a raging torrent, but Woodhull insists that the wagons and horses and oxen be swum across. Banion declares this is suicide. The argument waxes hotter, and the men engage in a fist fight finally, Banion being the winner. Molly appears on the scene as the fight ends and, misunderstanding appearances, denounces Banion as a bully, though she is by this time secretly in love with him. Woodhull takes his section of the expedition up the river to a ford and crosses, the rest of the train following some miles behind. Banion and Jackson, scouting on ahead, come across the smoking remains of Woodhull's wagons, which have suffered a disastrous attack by Indians. Further along, Jackson and Banion hear a cry and are just in time to rescue a man from death in the quick sand. It is Woodhull. Jackson is all for throwing him back when he recognizes him, but Banion prevents this. Added to the hardships which the wagon train is suffering is the lack of food. The sight of buffalo tracks comes as a Godsend. Soon the buffalo are sighted, and the men prepare for action. Jim Bridger, Jackson's old pal and the owner of Fort Bridger, who is freighting supplies across from Council Bluffs to his fort, joins the train just in time for the hunt. Whirlwind excitement follows as the mounted hunters attack the stampeding herd of buffalo and a good supply of fresh meat is secured. During the next few days the pioneer find evidence that Indian are on their trail. A prairie fire, set by the redskins, threatens the train. In the midst of this Banion rescues Molly from the enveloping flames and as he holds her fainting body in his arms, he kisses her upon the lips. She pretends to be very angry at this. The caravan, dusty, exhausted and depleted by hardships, reaches Fort Bridger, where the wedding of Molly and Woodhull is scheduled to take place. here Bridger and Jackson indulge in an old-time drinking bout and, to top it off, shoot tin cans from each others heads at a hundred yards to celebrate "the days when a friend could trust a friend." Joe Dunstan arrives at the Fort with news of the gold discovery in California, and this astonishing information spreads like wildfire among the pioneers. Dunstan also brings proof that Banion is guiltless of the cattle-rustling charges Woodhull brought against him. Banion, unwilling to face Molly's marriage to Woodhull, pushes on ahead. Molly is dressed in frontier bride's attire, but before the ceremony can take place, Bridger, now cold sober, steals into her wagon boudoir and tells her that if he could only get drunk enough, he could remember some good news about Banion. Molly plies him with applejack until the fumes loosen his memory and he recalls Dunstan's message that Banion is innocent of the charges against him. Molly refuses then to go on with the wedding and is about to start out with Bridger to overtake Banion when she is wounded by an arrow shot into the wagon circle from the darkness. This is the opening shot of the Indian attack. The redskins fall upon the train on overwhelming numbers and are about to annihilate it when Banion and the soldiers arrive, summoned by Molly's little brother Jed, who sneaked through the fatal Indian ring of death. Molly now admits she loves Banion, but her father stubbornly declares she must marry Woodhull. Banion, heart-broken, declares he will go to California and forget. The gold fever has taken possession of a large number of the pioneers in the train and, despite Wingate's exhortations to continue on to Oregon and free lands, at the parting of the trail about half the wagons split off and head for California. Molly sends Jackson with the California train in search of Banion, while Wingate and his followers continue on into the snows of Oregon. A year later, Banion has made his pile in the California gold fields. On the same day that Jackson discovers his whereabouts, Woodhull, seeking vengeance for the loss of Molly, also comes upon Banion's shack. Woodhull is about to ambush Banion and kill him when Jackson shoots first. Woodhull dies. Jackson tells Banion that Molly is awaiting him in Oregon, and Banion goes to a lovers' meeting at the Wingate's new Oregon pioneer home. 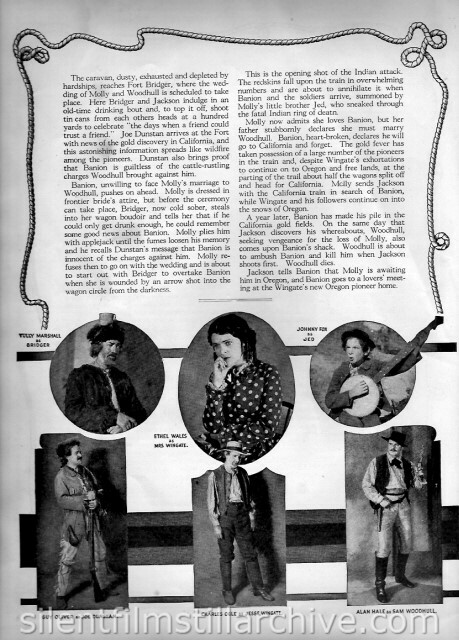 (left to right, top row) Tully Marshall as Bridger, Ethel Wales as Mrs. Wingate, Johnny Fox as Jed. 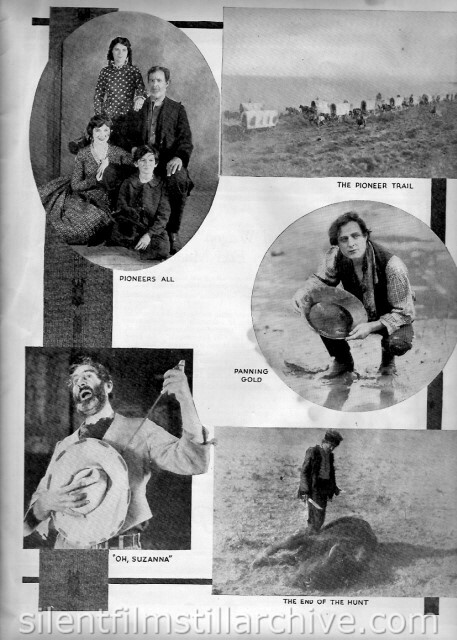 (bottom row) Guy Oliver as Joe Dnstan, Charles Ogle as Jesse Wingate, Alan Hale as Sam Woodhull. 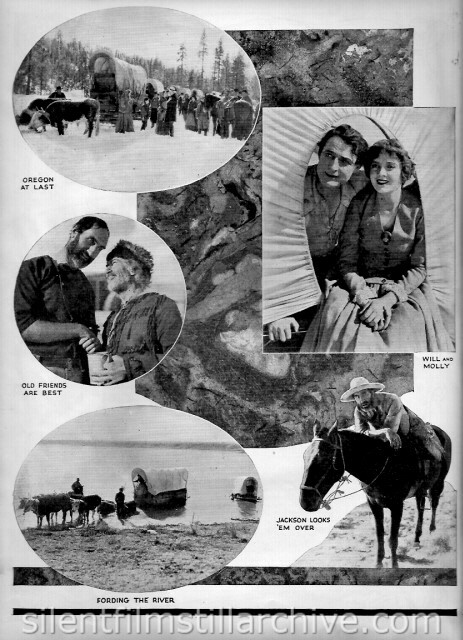 If it were possible to take behind the scenes the twenty million motion picture fans so that they might gain a slight conception of the tremendous task involved in making an epic picture such as "The Covered Wagon," it would disprove the unjustified claim that motion picture producers are satisfied with makeshifts and are careless of detail. When Famous Players-Lasky Corporation determined upon the huge task of translating to the screen Emerson Hough's novel, "The Covered Wagon" as a Paramount picture, it was with a full knowledge of what was entailed. It meant weeks of preparation, painstaking research, gigantic expenditure and a responsibility almost unequalled in the history of the films. 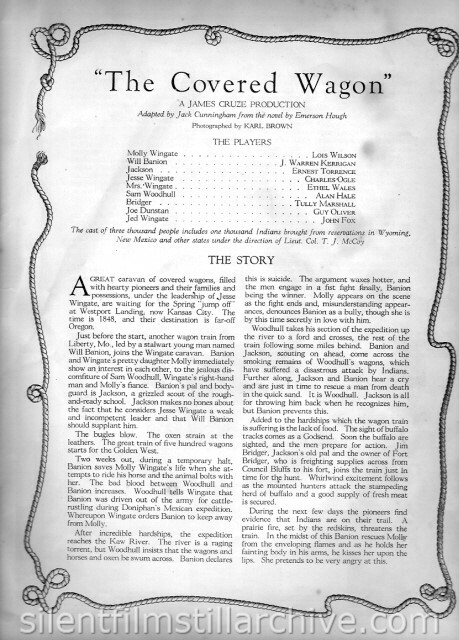 Instead of acting as a deterrant, this only spurred them on to greater effort and determination to make this not only an entertaining drama of a vital period in American history, sufficiently recent to compel and hold the audiences of today, but likewise an historical document on celluloid, preseving for all time the accurate specatle of the great task of the pioneers who braved the trails across the continent in the face of untold hardships, dangers and privations. James Cruze, producer of "The Old Homestead" and "Hollywood," was given the task of making the photodrama. A staff of fifty or more experts was assigned to him, and immediately the preliminary work of research and location finding was entered apon. Nine states -- California, Utah, Nevada, Idaho,, Wyoming, Montana, Oregon, New Mexico and Arizona -- were combed for locations and data, material and "properties." Meanwhile the costiming department was preparing for the immense number of period garments to be worn -- plainsmen, trappers, Indians, guides, emigrants, scouts, cattlemen, drivers, etc., etc. -- all must be represented. The Research Department was busy collating data. State Historical Socities were appealed to and among those who answered were A.E. 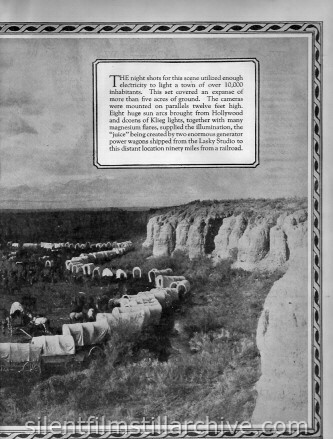 Sheldon, sperintendent of the Nebraska State Historical Society, who supplied valuable photographs and data about the Oregon Trail in that state; Ennice G. Anderson, State Historian of Wyoming, gave advice and references regarding Fort Bridger and other historic forts in Wyoming. So it came from all quarters until the pile of material began to assume formidable proportions. 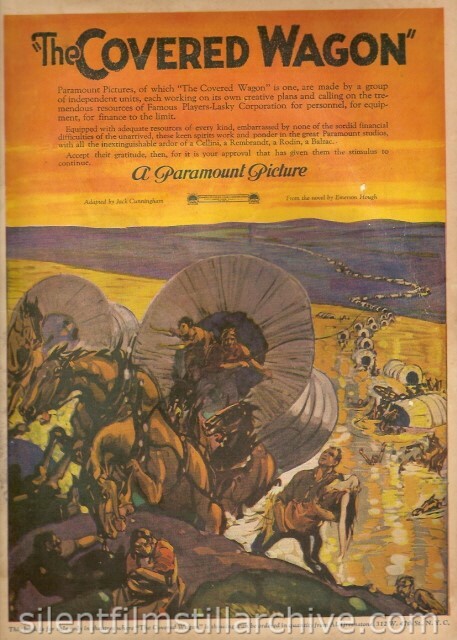 When the idea of putting "The Covered Wagon" on the screen first came to Paramount, one of the problems was the buffalo hunt. Where in Sam Hill would there be found in 1922 a herd of wild bison roaming the plains at will? Then Jim Cruze remembered hearing of buffalos on a big barren island eighteen miles out in Salt Lake. So they proceeded to investigate and discovered that a firm known as Buffalo Livestock Corporation owned the shaggy beasts and for a consideration was willing to let them be used for the picture. If you have never seen a buffalo close up, let me tell you that is is a sight not soon to be forgotten -- I mean a wild one. They have a bad eye. Also they are evil tempered beasts. And they seem to dislike horses and men especially. They can outrun a horse up hill. They are quick as cats and can turn on a circle. (Maybe that's why they are on the five cent pieces we use nowadays.) They charge, and come up with their wicked heads and horns and everything is fish that comes to their net. If they get headed in one direction, nothing can stop them. So the big problem that confronted the picture people was to get them to run before the camera. Cowboys droe the buffalo in herds of a hundred or so across the mountain and down into the level plain where the bulkhead for the camera had been erected. Sometimes the punchers would "spill them," which means that the herd would split and part would take their own course, generally up the hill again. The calves ran besie their mothers, as fast as the old ones. Three or four days were consumed in this way, but finally they got a big bunch to run past, and during this the actors -- J. Warren Kerrigan, who has the male lead; Tully Marshall as Jim Bridger, another historical old scout; Ernest Torrence as Jackson, took after them. Thus the hunt was filmed. Thrills? Well, take all the wild west shows and combine them and you get some idea of what is was like. Work? Those actors never worked so hard in their lives before and never will again -- for they don't make pictures like this more than once in a lifetime. And it was hotter than the hinges of Tophet, with alkali dust and alkali wind and salt water breezes that burned your face and blistered your lips and made your eyes water. There were no casualties, but some near ones. Karl Brown, the chief cameraman, wanted to experiment on a close-up of a buffalo, so the punchers roped a big bull and brought him in. Karl and his assistant with the cameras were in a wagon drawn by a team of horses. "Turn the buffalo loose and then rope him right near," said Brown. The cowpunchers turn the buffalo loose and the buffalo turned loose on his own account. He went for the horses. 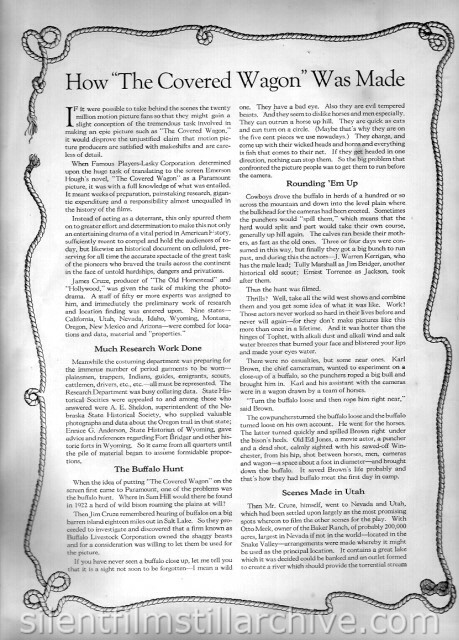 The latter turned quickly and spiled Brown right under the bison's heels Old Ed Jones, a movie actor, a puncher and a dead shot, calmly sighted with his sawed-off Winchester, from his hip, shot between horses, men, camera and wagon -- a space aout a foot in diameter -- and brought down the buffalo. It saved Brown's life probably and that's how they had buffalo meat the first day in camp. which would later be forded by the wagon trains, every animal being obliged to swim as in the actual experiences of 1848-9. Oxen had to be obtained to pull them and so 150 yoke of steers were secured and broken to the yoke; the yokes and chains had to be made. In addition 200 mules were required, of the army type -- no small task in itself. A herd of 500 buffalo was utilized for the big hunt scenes. A thousand horses, 100 cowponies with equipment, several herds of ordinary cattle flanking the wagon trains were needed. Five hundred drivers for the ox teams -- types of bearded, bronzed plainsmen, families of wives, children, etc., dogs, guides, wagon train captains, all were amont the neccessities. The country was untouched by modern equipages, there were no telephone or telegraph wires, no trains, no autos. In fact, much of the territory used never has been trodden by man; all of it is wild and primitive -- in none of it has a camera ever clicked. 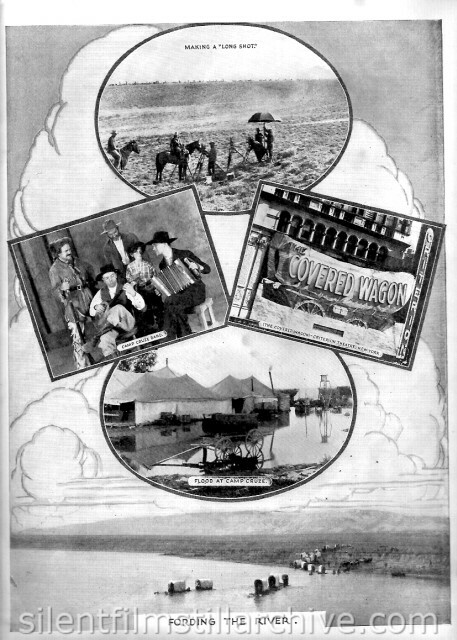 Facts About "The Covered Wagon"
To make "The Covered Wagon," 3,000 actors spent three months in the Utah desert, eighty miles from a railroad. They endured floods, blizzards, zero temperatures and sometimes lack of food. 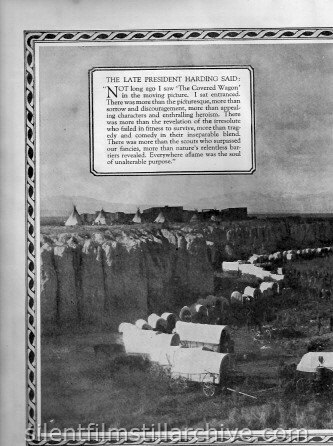 One-tenth of all the blanket Indians in the United States appear in "The Covered Wagon." They are Arapahoes, Bannocks, Shoshones, and Crows from Wyoming, Navahos from Arizona. Nine square miles of waste prairie were burned up for the great Prairie Fire scenes. The scenes in which the 500 wagons ford the mile-wide rushing torrent were made at great risk, for men and horses and oxen actually had to swim for their lives. Five hundred bison were used in the Buffalo Hunt scenes. This herd, the largest in the United States, has now been broken up and scattered and will never be seen intact again. From Camp Cruze, where the big scenes of the picture were made, to the nearest town was over two steep ranges of the Wah-wah Mountains. The motor equipment of the camp in making this trip covered enough mileage to stretch three and a half times around the world. The temperature during the day was frequently ninety in the shade; at nightfall it generally dropped to zero and was many times six below before morning. 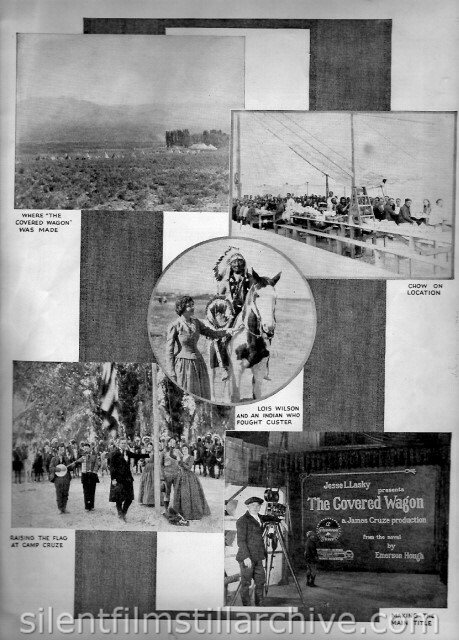 Over forty thousand feet of canvas was used in covering the wagons. It took sixty wagons hauling material for three weeks to build Fort Bridger. The Indians in the picture gave a bid dance and dlected Director James Cruze a member of their council, giving him the name of Chief Standing Bear. He was presented with a war bonnet by the Arapahoe chief, Yellow Calf. The snow scenes in the picture were made after an actual blizzard which providentially appeared just when needed. In the mess tents the cast of 3,000 ate in three shifts, 1,000 being accomodated at a time. A whole studio was practically transported into the desert. 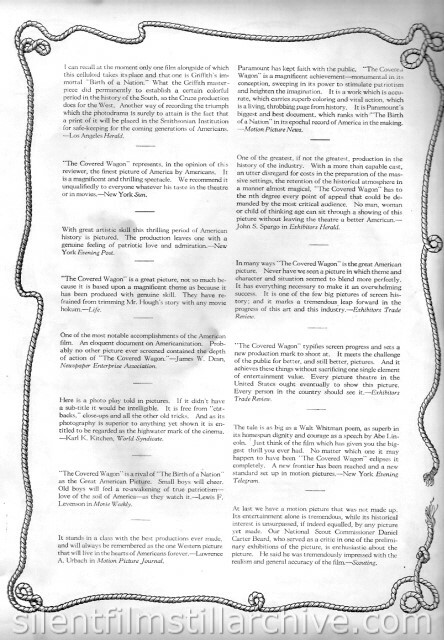 A complete comissary department, tents for 3,000, electric lighting plant, developing and projecting department, blacksmith shop, property construction department, post office, costume department, doctor's office, painting shop, financial, armory, publicity and carpentry department, are some of the units engaged. "The Covered Wagon" is the most colossal film undertaking of all times. Nothing like it has ever been done before; probably nothing like it will ever be done again. THE LATE PRESIDENT HARDING SAID: "Not long ago I saw 'The Covered Wagon' in the moving picture. I sat entranced. There was more than the picturesque, more than sorrow and discouragement, more than appealing characters and enthralling heroism. There was more than the revelation of the irresolute who failed in fitness to survive, more than tragedy and comedy in their inseparable blend. There was more than the scouts who surpassed our fancies, more than nature's relentless barriers revealed. Everywhere aflame was the soul of unalterable purpose." The night shots for this scene utilized enough electricity to light a town of over 10,000 inhabitants. This set covered an expanse of more than five acres of ground. The camera were mounted on parallels twelve feet high. Eight huge sun arcs brought from Hollywood and dozens of Klieg lights, together with many magnesium flares, supplied the illumination, the "juice" being created by two enormous generator power wagons shipped from the Lasky studio to this distant location ninety miles from a railroad. 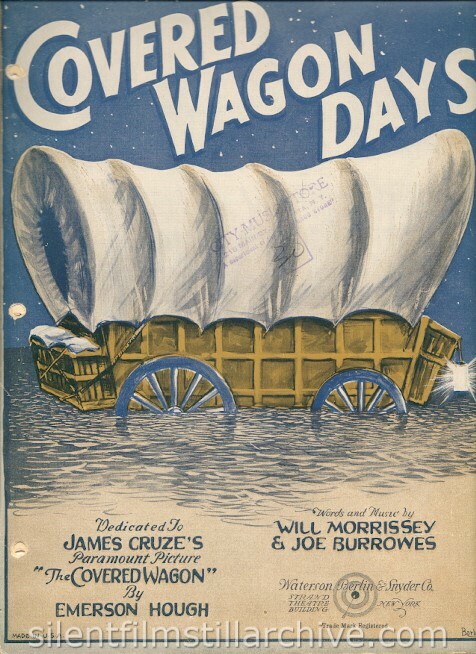 Who's Who in "The Covered Wagon"
JAMES CRUZE, Producer -- Born in Ogden, Utah (the state of "The Covered Wagon") in 1884. Started his theatrical career with medicine shows and afterwards graduated into melodramas and Shakespeare. Joined motion pictures as a character actor and had considerable success. Took up directing and made, among other successful productions, Wallace Reid's "The Lottery Man," "Always Audacious," and "The Dictator," and "The Old Homestead." Is now working upon Paramount's spectacular comedy-drama of movieland "Hollywood," in which 50 noted stars will be seen. CHARLES OGLE -- Hails from Pennsville, Ohio. He studied law but went on the stage. He was with the shuberts for ten years and began picture work with the Edison Company. For several years he has been a member of the Paramount stock Co, playing character roles. JACK CUNNINGHAM, Scenarist -- Born in Ionia, Iowa. Started as a newspaper man and has written over a hundred photoplays. Furnished the continuity for, among other successes, Elinor Glyn's "Beyond the Rocks," starring Gloria Swanson. KARL BROWN, Cameraman -- A veteran of the business. Is James Cruze's regular cameraman. Photographed "The Old Homestead" and is not "shooting" "Hollywood". LOIS WILSON -- Born in Pittsburgh, Pa. The stage lured her, and her first part was a small role in "The Dumb Girl of Portici." She did the title role in "Miss Lulu Bett." She has a touching role in "Manslaughter." She is the leading woman in "The Covered Wagon." GUY OLIVER -- A native of Chicago. He has been in pictures for fourteen years, starting with the old Lubin Co. In Paramount stock he plays characters roles with skill. He has a strong part in "The Covered Wagon." JOHN FOX -- Twelve years old. 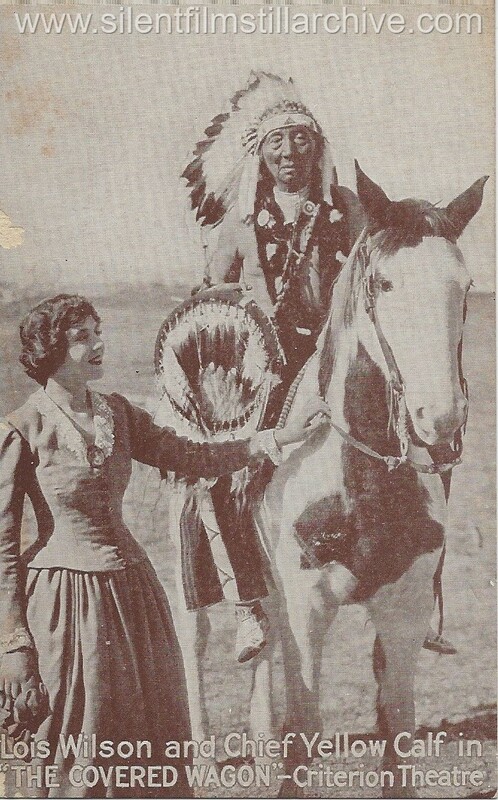 Played in "The City Sparrow" with Ethel Clayton for Paramount. Did good work as "Ek," the quaint little homeless spirit in "One Glorious Day," also a Paramount picture. He is well cast as Jed Wingate, in "The Covered Wagon." ALAN HALE -- Mr. Hale is from Washington, D.C. He began is screen career in 1911 and first appeared in a Paramount picture in 1916, "Pudd'nhead Wilson." He was a sympathetic heavy in "A Wise Fool" and the villain in "One Glorious Day." He has a splendid part as the heavy in "The Covered Wagon." ETHEL WALES -- Well-known Paramount actress has an important part in "The Covered Wagon." Miss Wales will be remembered for her excellent work in "The Old Homestead" and before that in "Miss Lulu Bett." Her role in "The Covered Wagon" affords her a splendid opportunity to display her talents as an emotional actress. TULLY MARSHALL -- Born in Nevada City, Cal. Started his theatrical career as a call boy in the old Baldwin Theatre in San Francisco. He began work on the screen in 1915 and for a long time has been a member of the Paramont Stock Co. Has the part of Jim Bridger, old time trapper and guide in "The Covered Wagon." ERNEST TORRENCE -- Born in Edinburgh, Scotland. He went on the stage in 1901 in "The Emerald Isle." 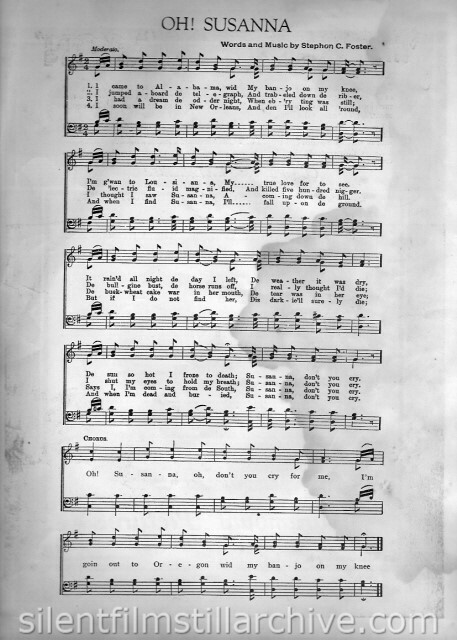 Ten years of musical comedy and light opera work followed, and in 1911 he came to America wherw he resumed his career. He has played in on five or six pictures. His first was "Tol'able David." He was seen as the clown in "Singed Wings" with Bebe Daniels. J. WARREN KERRIGAN -- Born in Louisville, Ky., and educated at Chicago University. He is a well known stage player and appeared in "The Road to Yesterday" and "Brown of Harvard." During his screen career he has appeared in many productions. He is leading man in "The Covered Wagon." What They Think of "The Covered Wagon"
There is a rhythm of empire building about the whole which is impelling. Ideals and adventures go hand in hand and romance winds throughout the film with persistent theme. Death and birth, hardships and rollicking good times vary the progress of the picture. Let me assure you that this film is not merely a super western, far from it. It is tangible evidence of the hights to which human nature may rise in searching for its ideals. -- Los Angeles Examiner. One of the most notable accomplishments of the American film. 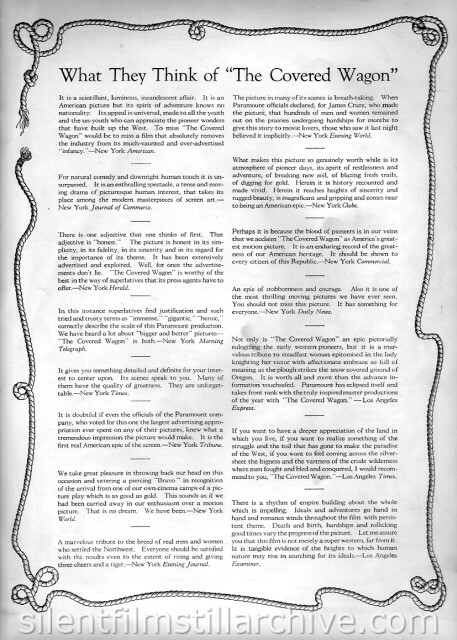 An eloquent document on Americanization. 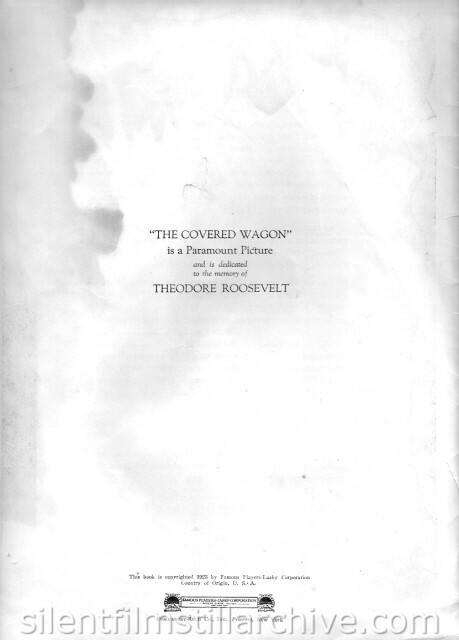 Probably no other picture ever screened contained the depth of action of "The Covered Wagon." -- James W. Dean, Newspaper Enterprise Association. 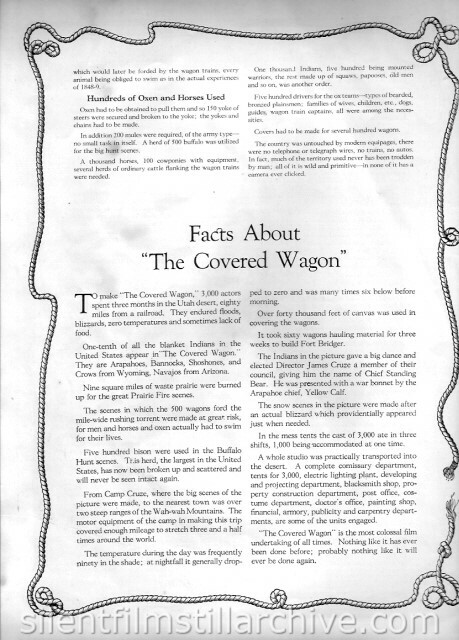 "The Covered Wagon" is a rival of "The Birth of a Nation" as the Great American Picture. Small boys will cheer. Old boys will feel a re-awakening of true patriotism -- love of the soil of American -- as they watch it. -- Lewis F. Levenson in Movie Weekly. 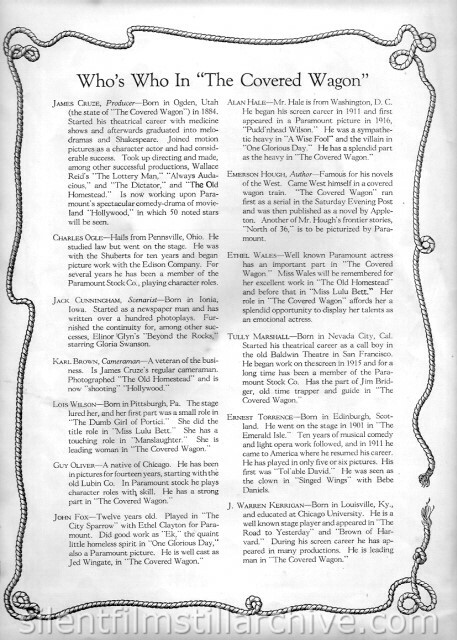 It stands in a class with the best productions ever made, and will always be remembered as the one Western picture that will live in the hearts of Americans forever -- Lawrence A. Urbach in Motion Picture Journal. Paramount has kept faith with the public. "The Covered Wagon" is a magnificent achievement -- monumental in its conception, sweeping in its power to stimulate patriotism and heighten the imagination. It is a work which is accurate, which carries superb coloring and vital action, which is a living, throbbing page from history. It is Paramount's biggest and best document, which rangs with "The Birth of a Nation" in its epochal record of American in the making. -- Motion Picture News. 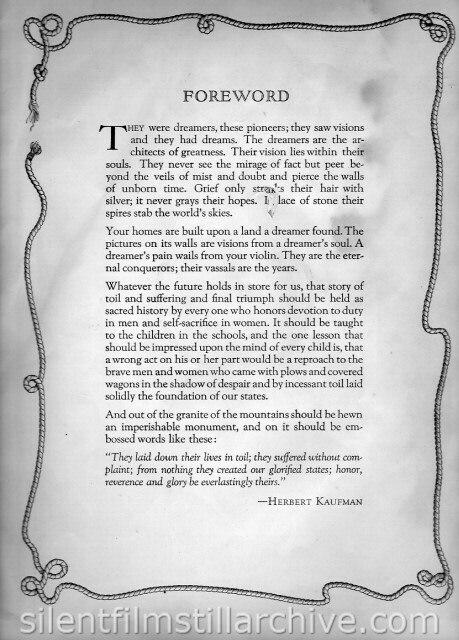 The tale is as big as a Walt Whitman poem, as superb in its homespun diginity and courage as a speech by Abe Lincoln. Just think of the film which has given you the gbiggest thrill you ever had. No mater which one it may happen to have been "The Covered Wagon" eclipses it completely. A new frontier has been reached and a new standard set up in motion pictures. -- New York Evening Telegram. At last we have a motion picture that was not made up. Its entertainment alone is tremendous, while its historical interest in unsurpassed, if indeed equalled, by any picture yet made. Our National Scout Commissioner Daniel Carter beard, who served as a critic in one of the preliminary exhibitions of the picture, is enthusiastic about the picture. He said he was tremendously impressed with the realism and general accuracy of the film. -- Scouting. 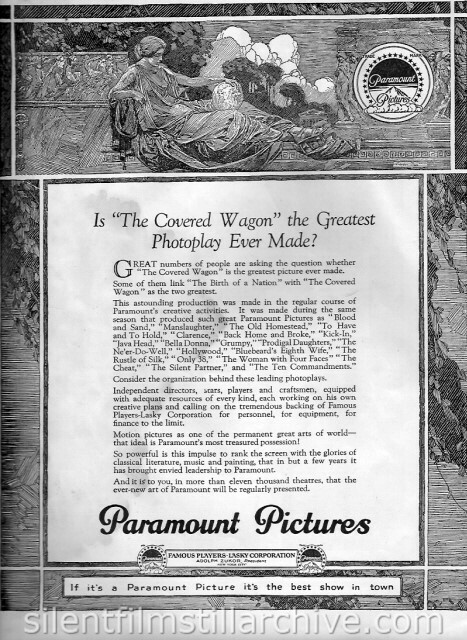 Paramount Pictures, of which "The Covered Wagon" is one, are made by a group of independent units, each working on its own creative plans and calling on the tremendous resources of Famous Players-Lasky Corporation for personnel, for equipment, for finance to the limit. Equipped with adequate resources of every kind, embarrassed by none of the sordid financial difficulties of the unarrived, these keen spirits work and ponder in the great Paramount studios, with all the inextinguishable ardor of a Cellini, a rembrandt, a Rodin, a Balzac. Accept their gratitude, then, for it is your approval that has given them the stimulus to continue. Adapted by Jack Cunningham. From the novel by Emerson Hugh. 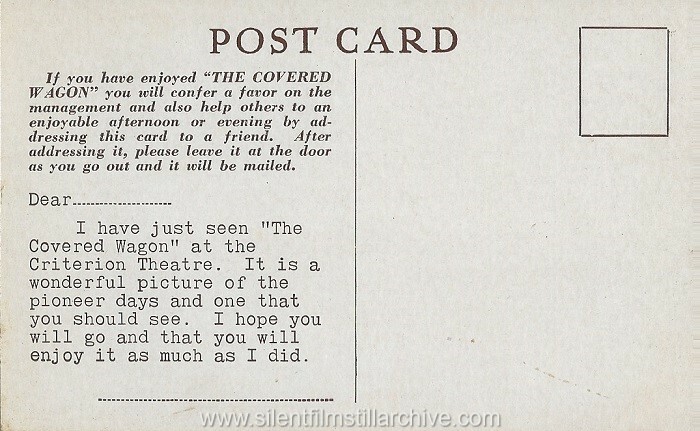 If you have enjoyed "THE COVERED WAGON" you will confer a favor on the managemet and also help others to an enjoyable afternoon or evening by addressing this card to a friend. After addressing it, please leave it at the door as you go out and it will be mailed. I have just seen "The Covered Wagon" at the Criterion Theatre. It is a wonderful picture of the pioneer days and one that you should see. I hope you will go and that you will enjoy it as much as I did. NOTE: The Criterion Theatre was on Broadway in New York City and was owned by Paramount. Paramount screened all of their biggest films there, and The Covered Wagon likely had a long run in this theater. 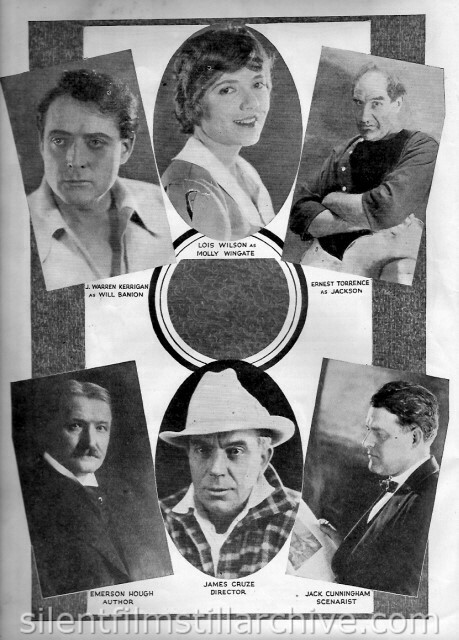 with Lois Wilson, J. Warren Kerrigan, Ernest Torrence, Charles Ogle. Directed by James Cruze. Paramount.